Found on every continent except Antarctica, the chicken is the most popular bird on Earth. They are also pretty smart. 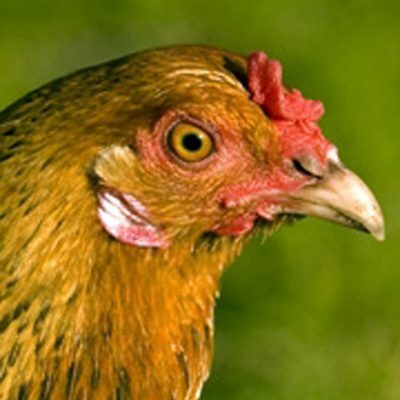 Chickens can identify over 100 different chickens and remember them in relation to their own "pecking order." (Try doing that yourself with your co-workers!) They live in a complex social system and have over 30 different calls that humans have been able to identify. This chicken clucking ringtone is just one example. And, yes, they are affectionate. First domesticated in S.E. Asia, chickens eventually made their way around world. Because of their popularity as food, they are often mass produced in huge factory farms and undergo selective breeding to produce over sized breasts. If you eat chickens try to get them from small farms which produce chickens and eggs humanely – free-range where chickens can do what they do best – scratch around with other chickens outside.